If you love to craft or create handmade products I’m sure someone has suggested that you should start an Etsy shop. I thought about opening one for years before I finally decided to go for it. Less than 8 months after I started I was able to leave my corporate career behind and run my Etsy shop full time. It’s one of the best decisions ever made so I want to share the top 5 reasons that I think you should open an Etsy shop today. To start an Etsy shop all you need are a few handmade products (or vintage), a camera to take photos (many sellers use the camera on their phone), and a little bit of time to learn the ins and outs of Etsy. If you use the link at the bottom of this post to sign up you’ll get $8 worth of free listing credits so you’ll be able to list 40 products for free. I’ve done the craft show circuit before with some success but my target market was harder to find in my local community. Because of Etsy, I’m able to sell my products to customers around the world. This allows me to create products for a specific target market without having to worry about whether my target market aligns with my local community. One of the biggest benefits to running my Etsy shop full time is that I’m 100% in charge of my schedule. I set up my shop so that orders go out within 7 days of the order date. This gives me a ton of flexibility. Some shops even set up a 2-3 week processing time with great success. This means that if an emergency comes up or you just don’t feel like working you have the freedom to take time off. This also lets me work during my toddler’s nap time or at night after the kids have gone to bed. If you’ve ever tried to create your own website you know how challenging it can be. There are so many parts and pieces that you have to put together and it can often be really expensive especially if you encounter tech issues. Etsy does all the heavy listing for you. They’ll walk you through setting up your shop step by step and have a lot of resources available if you have trouble along the way. Etsy also has an app for sellers that allows you to monitor your shop from your phone or tablet. Whether your goal is to cover the electric bill, have some extra spending money or replace your current income it’s all possible through Etsy. You can choose your income goal and how much time you want to put into your shop. Start out with a few listings and work to perfect those and grow your Etsy shop over time. 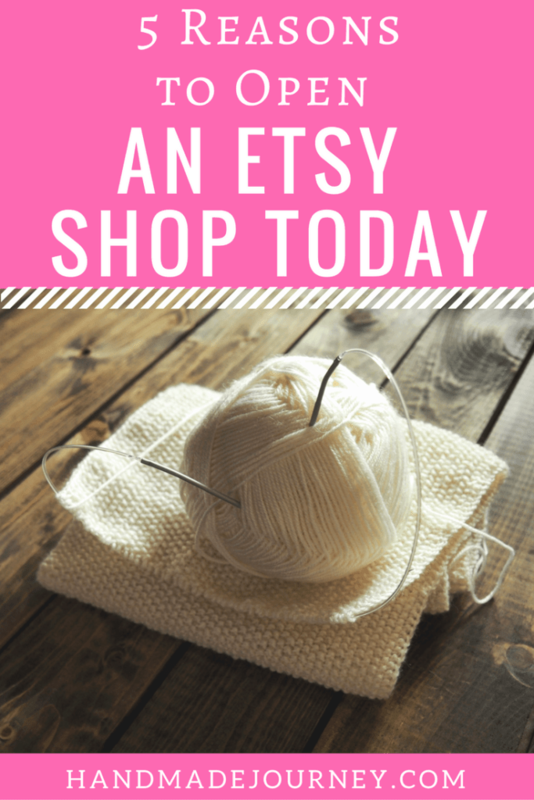 Ready to start an Etsy shop? Click here for $8 worth of free listings to get you started. Product photography goes hand in hand with a good SEO strategy. SEO is how you get found in the search results and good photos are what determine if a buyer will click on your listing. It doesn’t matter if you show up on page one of the search results unless you have good photos that entice Etsy shoppers to click. Here are some basic tips that I’ve learned from my experience to help create product photos for Etsy that buyers will want to click. 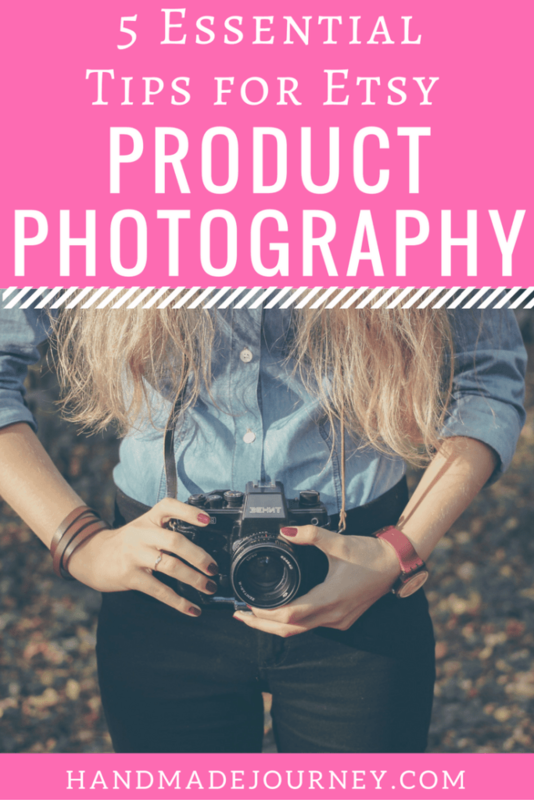 The first photo you add to your product listing is crucial to getting views and sales. You want to make sure that your product is the star of the show. The easiest way to do this is to choose a simple background that doesn’t compete with your product. A lot of Etsy sellers choose white or wood backgrounds which are great options. They work for a lot of products but don’t feel like you have to go that route. You can think outside the box with your product photography by trying out scrapbook papers, fabrics, placemats, distressed wood, metal, wallpaper, etc. Currently, I use a dark blue piece of beadboard for all of my first photos. I recommend experimenting with different backgrounds until you find one that lets your product shine and is a good fit for your brand. Some sellers add decorative items into their main photo as well to help draw attention and emphasize what the product is. You can do this but make sure they don’t overshadow the product. Adding additional items to the first photo is a more advanced technique because it can easily make a photo look cluttered when viewed in the search results. To start, I recommend keeping just your product and a background in your first photo. One thing I never recommend is placing your products on the floor for your photos. Even if you have gorgeous hardwood floors, buyers are going to wonder why you’re selling them something you’ve had on the floor. I recommend using a similar first photo for each product within your shop to create a cohesive look for your shop. This helps define your style and your brand. Think of how Target does this by using a red and white color scheme through the whole store. No matter where you are in Target you can see their branding on display. Your Etsy shop should feel the same way. Whether you use the same background for each photo or you create a theme for your photos, make sure that each first photo has a similar look and feel that represents your brand. Great lighting is the key to amazing product photos. To help achieve natural looking photos that are clear and bright, I always recommend using natural light and avoiding harsh flashes or artificial light. My favorite places to take photos are beside a window or door or outside under a covering such as a porch or in the shade of a building. When using natural light make sure to avoid direct sunlight which can be too harsh. You can use a sheer curtain to help diffuse light if your photography spot only has direct sunlight. Another tip is to use a homemade reflector such as a piece of white foam board, poster board or cardboard covered in aluminum foil to bounce light on the side of the product that isn’t receiving as much natural light. Too much shadow can be as bad as too much light. I like this blog post from White on Rice Couple that shows a creative background choice and it shows how to use a piece of white foam core to help bounce light onto the side that is opposite from the natural light source. A photo that shows scale can be achieved by placing your product beside a common object or use a model for apparel and accessories. This helps buyers feel confident that your product is the size they are looking for. 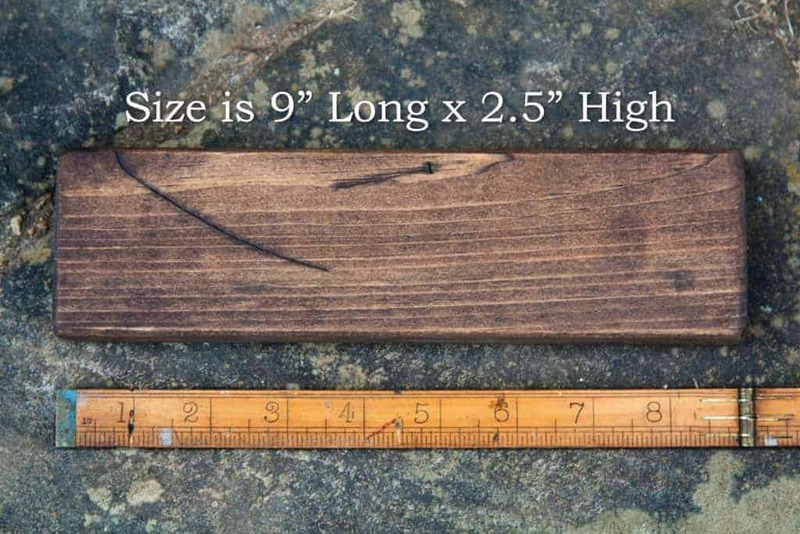 I currently use a ruler with a text overlay that includes the size to help buyers get an idea of the size of my signs. I added the text using Canva. Take a close up photo that shows the detail, texture and quality of your work. Some cameras have a macro setting that is perfect for close up photos. Show a different angle or detail than you used in your other photos if possible. Stage a photo of your product in use to show it’s function. Help your customer imagine your product in their lives. If you sell cutting boards, put a knife and block of cheese in the photos. For jewelry such as rings or bracelets, recruit a friend to be a hand model. Home decor can be staged in your own home. Editing photos can be tricky for Etsy sellers. It’s hard to know where to start and it’s really easy to over-edit a photo. I recommend keeping it simple by editing the exposure (how much light the photo has) and by sharpening the photo. Doing these two things helps create a bright and in focus photo that will have a classic look. For editing photos on your phone or tablet, I recommend using a free app called Snapseed available for Android or iOS. If you are on your computer I recommend using the free version of PicMonkey or for best results I recommend Photoshop. All of these programs allow you to adjust the exposure (brightness, highlights, shadows, contrast) and sharpen the image. Edit slowly to make sure you’re not overdoing it. Less is often better when it comes to editing. When working with new Etsy sellers, I’ve noticed that there are a few key areas that Etsy shop owners are missing that are must-haves for a professional looking shop. This missing information is like a missing store name on the front of brick and mortar stores or a missing sales associate behind the counter. 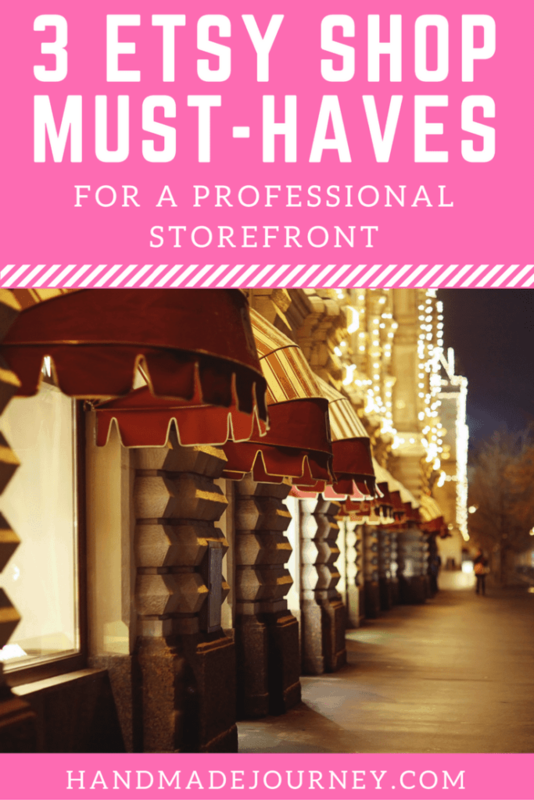 Check out the must-haves that you should add to your shop today! The shop owner photo is your chance to put a face behind your shop name. Etsy buyers are looking for the human experience that they can’t get from a corporate website. They want to know you and be a part of your story. Have someone take your photo with a non-distracting background and make sure you’re smiling. The best part is, all that needs to appear in this picture is your head and shoulders. No need to change out of your yoga pants! Make sure the photo is bright and welcoming because this photo represents you and is your opportunity to greet customers that enter your shop. Click here for photo tips that will also help with your shop owner photo. 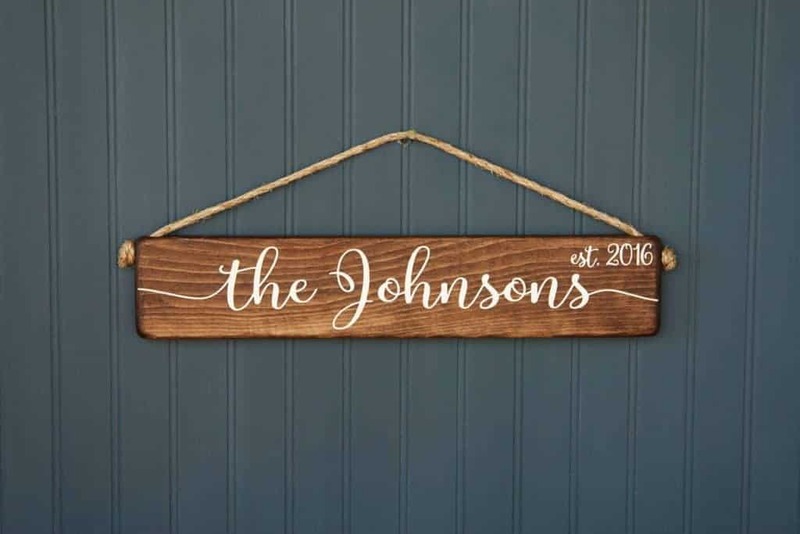 The Etsy shop title is the line of text that appears underneath your shop name. The shop title where you will tell your customers what you are selling and what it can do for them. I often refer to this as the tagline because a lot of shops use their tagline as their shop title. You have up to 55 characters to use here so make sure to take advantage of the space. Another vital reason to fill this info in is that Google uses this as your shop title in their search results. This means that you want to use keywords that a buyer might use to find your products when searching Google. The shop title is an excellent opportunity to use as many descriptive words as you can to help market your products to shoppers searching on Google and other search engines. Try to use long-tail keywords to really get specific. The Etsy shop icon is the square photo you will see at the top of Etsy shops which appears to the left of the shop name. If you don’t have one, a blank square will appear which makes it look like something is missing from your shop. To create a shop icon I recommend using Canva which is a free online design program. They have templates for Etsy shop icons and make creating a shop icon that aligns with your branding super easy. The shop icon is fairly small, so I recommend that you include your business name or logo only. I wouldn’t recommend using a photo of yourself or a photo of your products as a shop icon. Trying to add too much will make it appear busy and hard to read. #1: What is a long tail keyword? 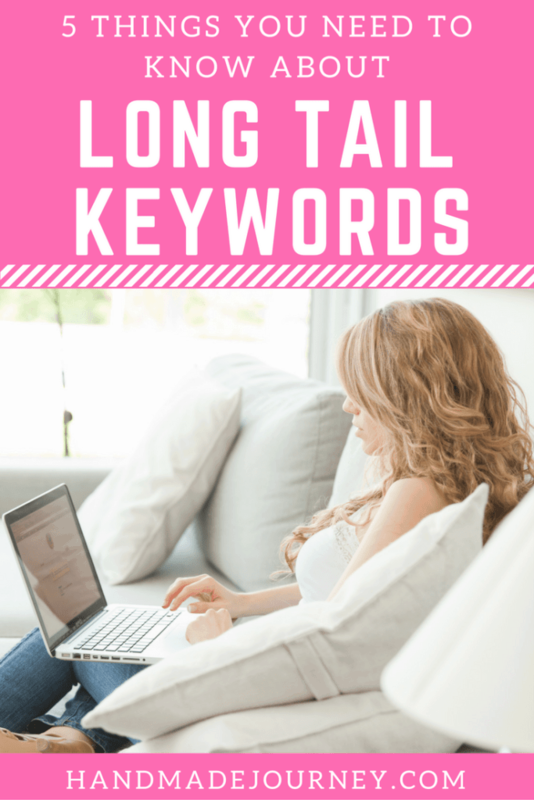 #2: Should I be using long tail keywords within my Etsy shop? Long tail keywords are amazing for standing out amongst your competition, especially if you are just getting established. 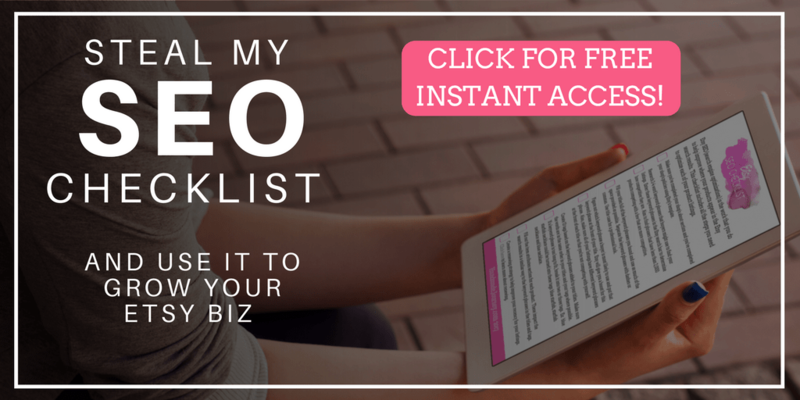 You will have a better chance at ranking (go here to learn about SEO and ranking) for a long tail keyword because they often are specific enough that you will have less competition in the search results. This is really important to ensure that your product is found and not lost in a search that is too competitive. As your shop grows you can work toward ranking for shorter and more competitive keywords. I’ve been able to rank on the first page for really competitive keywords like housewarming gift and Christmas gift but only after my products received a lot of favorites and sales. You’ll want to stick with long tail keywords when you are starting out. #3: How do I incorporate long tail keywords into my tags and title? 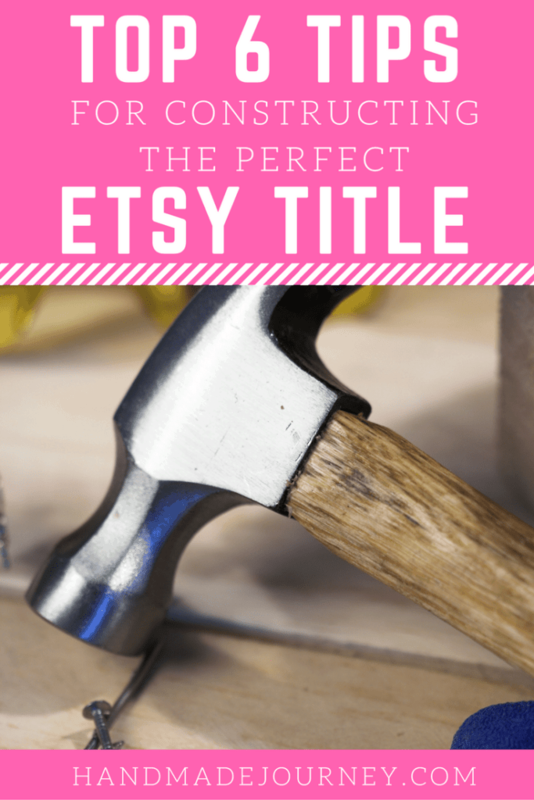 You can add your long tail keywords to your titles using the tips found in my Top 6 Tips for Constructing the Perfect Etsy Title post. Make sure that you are using keyword phrases that are appropriate for your product and make sure your title looks as professional as possible. Long tail keywords can be a bit tricky to add to tags because they can often be longer than 20 characters which is the limit for tags. To get around this, split your keyword phrases up if needed. An example of this is ‘green striped hair bow’ which is 22 characters. You could split this into two tags, ‘green striped hair’ and ‘striped hair bow’. This helps cover the phrase even though it is too long to fit into one tag. #4: How do I know which long tail keywords to use? Knowing which keyword phrases to use is the trickiest part of SEO. I like to sit down with my product in front of me and write out all the words I would use to describe the product. Think of color, texture, materials used, size, shape, and so on. Then go back and add a star beside the ones that you think describe your product best. You can then combine those words into long tail keywords. I also like to get the opinions of others to help create my long tail keyword phrases. Show people your product either online or in person and ask them which terms they would use to describe the product or find it if they were looking for it on google. Look for any trends to help you identify which keyword phrases would be best to use. An advanced method for finding the best long tail keywords is to use an online tool such as EtsyRank or Marmalead. They are Etsy SEO tools that helps you discover which keywords are working for similar products. Etsy titles serve so many purposes. They are absolutely vital to Etsy SEO, they tell the buyer what it is they are looking at and they are a buyer’s first look at your writing. First impressions are important so crafting the perfect Etsy title should be a priority for your Etsy shop. Trying to create a title that fits the bill for all of these purposes can be really daunting. There’s a fine line between pleasing the search engine and your buyers. When I first started my Etsy store in April of 2016 my titles were so short and just horrible. I had no clue what I was doing and didn’t get many sales. Updating my titles (as well as tags) has been one of the most helpful things I’ve done to get the sales I needed to quit my corporate job and focus on my handmade shop full time. Etsy allows up to 140 characters for your title. As I mentioned in my Etsy SEO post you want to a variety of keyword phrases in your title but you don’t want the title to be too long. Etsy says that shorter titles convert into sales better because they are easier for the buyer to read and understand. I recommend creating a title that is between 75 and 120 characters long. This gives you plenty of room to get in keyword phrases but ensures the title isn’t too long that it’s tough for buyers to read. I’ve seen a lot of Etsy titles with all caps or all lowercase letters. While I think that can have its place I really love the look of title case within a title. I’m not great at explaining grammar but click here to read more about what title case is and how to use it. When your listings are viewed from the search results only the first 20-40 characters will appear. The rest of the title will be truncated and will only be visible if the buyer clicks on your listing. For this reason the first few words need to be the most relevant words that accurately tell the buyer what it is they’re looking at. Separate your keyword phrases for readability. I recommend commas or dashes. P.S. – I know all of this can seem overwhelming and overly complicated. Take it one step at a time and just work on a few listings per day. Also, check out this post where I explain why Etsy SEO is so complicated and the factors that impact the search ranking. 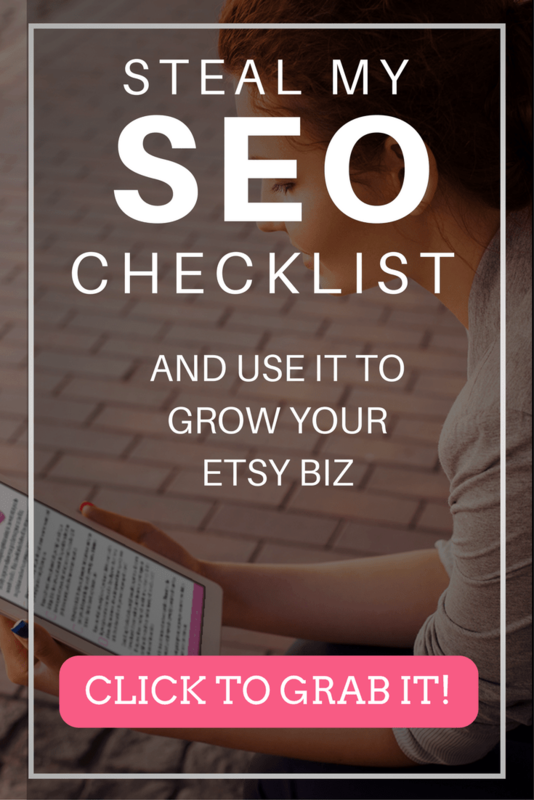 Ready to take your Etsy SEO to the next level?